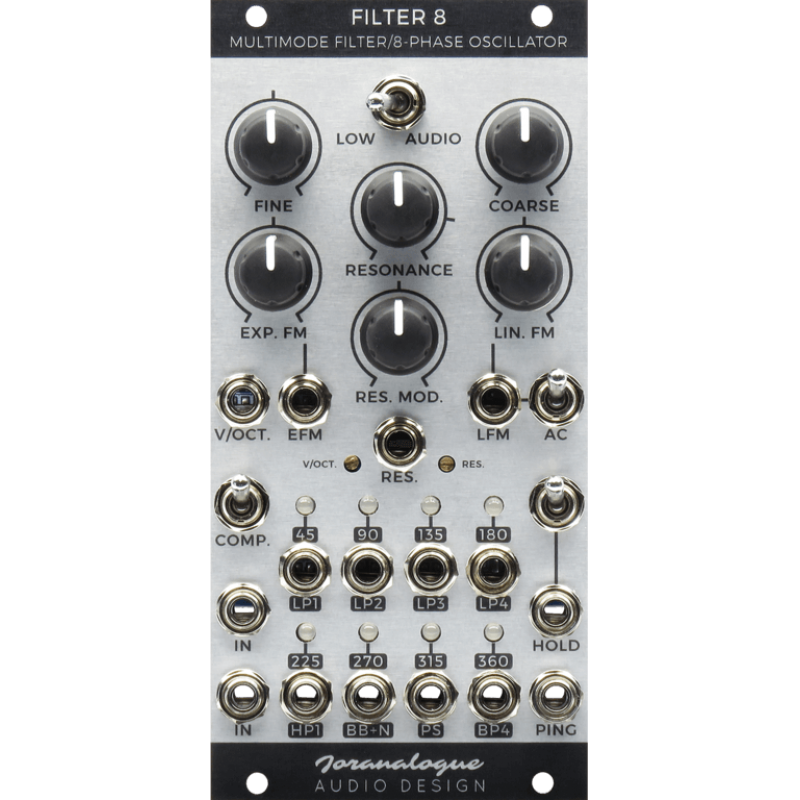 Representing the cutting edge in modular analogue voltage controlled filter (VCF) design, Filter 8 offers more possibilities and higher fidelity in 12hp than ever before. Key to Filter 8's performance is the innovative resonant feedback circuit. By increasing the resonance, all outputs will resonate at the filter frequency, without any low frequency loss. At higher resonance levels, self-oscillation is achieved, turning the module into an excellent 8-phase sine wave voltage controlled oscillator (VCO) with temperature and switchable gain compensation, low distortion, constant amplitude and accurate frequency tracking over at least 5 octaves. At sub-audio frequencies. Filter 8 can function as an 8-output voltage controlled slew modifier or 8-phase low frequency oscillator (LFO). Simultaneous exponential and linear frequency modulation is possible, for classic FM tones or chaotic modulation. A hold feature is also provided, 'freezing' the output voltages manually or under gate control. Ths is useful for halting modulations, or as a sync-like effect at audio frequencies. The dedicated 'ping' input allows you to easily create crisp percussive sounds with different timbres. While rooted in the legacy of classic synthesizers, Filter 8 provides a new approach to musical signal generators and modifiers: instead of simply a VCF, VCO, slew modifier or VCLFO, a single analogue module can now be any of those, and anything in between.